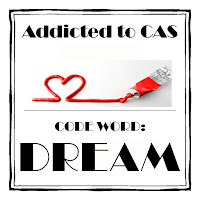 This card was made for the challenge at Just Us Girls, as well as the Dream cue word at Addicted to CAS and the shiny theme at Less is More. 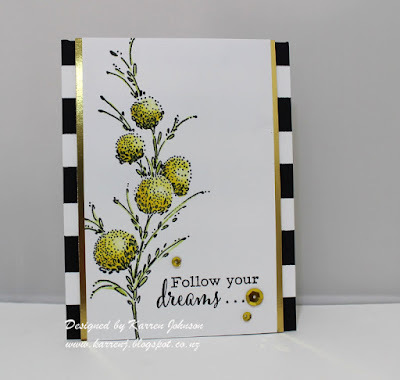 I started by stamping the Wide Stripes background stamp onto a white card base. Using my Misti, I had to stamp it about 6 times to get good coverage! 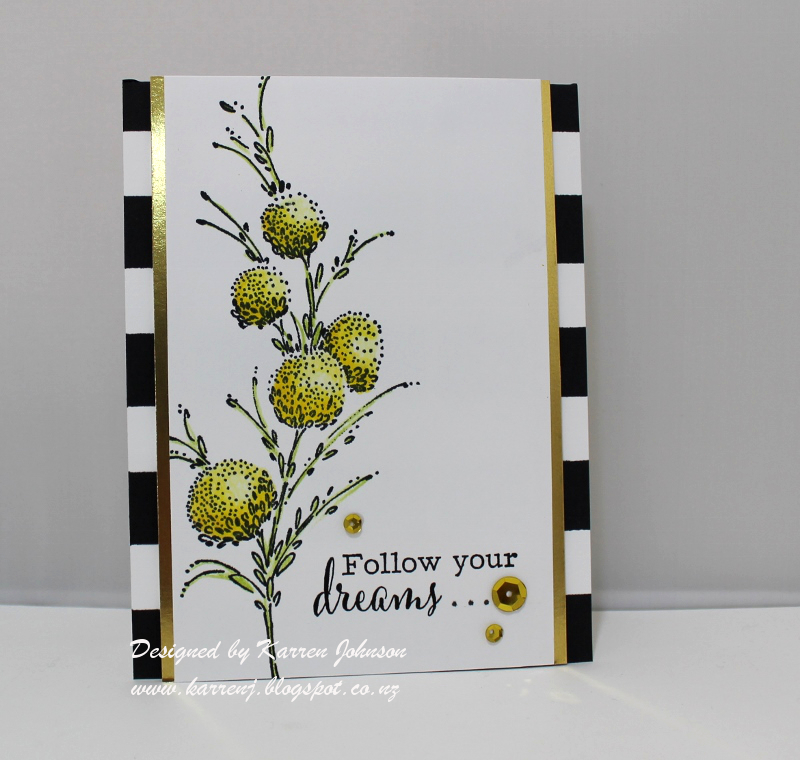 I then stamped the floral stamp onto a white panel and colored it with Prismacolor pencils. The sentiment was cut in half to make it fit and I then drew the dots with a multi-liner pen so it didn't look too offset. A strip of gold foil card down each side and some gold sequins and my card was finished. What an elegant card! LOVE the black stripes and the gold strips! So pretty! Stunning, Karren! The stripes are perfect! ooops! Great to see you played along at ATCAS Dream challenge too - works perfectly there too! Wow! Karren, this card is stunning! So elegant and love the touch of gold foil along the main panel! 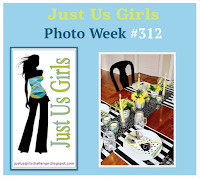 Thanks for joining in the fun at Just Us Girls! Great card. I love the black and white and touch of green. This is simply gorgeous, I love that touch of shine! Your card is just beautiful! The flowers are perfect for the inspiration photo as are the background stripes! Love how you make it sound so simple! Oh wow, this is so lovely! I love the touch of gold too! Thanks for playing with Just Us Girls! A very elegant card. Love the big bold stripes and the touch of gold. 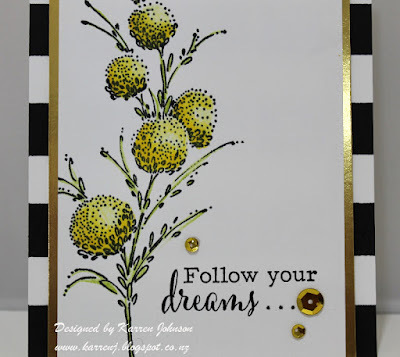 Karren what a stunning and stylish creation! Fabulous card, love the strips of shiny gold. And well done for stamping those stripes, this is why I NEED a Misti! Your card is wonderful. Love your gold strip accents. Thanks for sharing over at ATCAS. Wow wonderful card with that strip of gold. Glad you joined us over at ATCAS. beautiful and elegant card. Thanks for joining us at ATCAS!! Ey! congrats Karren! beatiful and elegant card! I missed this challenge :(. So very, very elegant. Just a wonderful card!